When the time comes to make that decision, it’s often difficult to make. 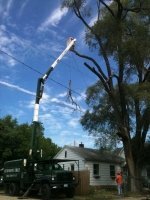 Economy Tree Service can help you! 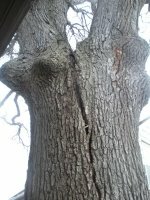 If you have a tree that is questionable, call us today. Economy will come take a look and give you a professional opinion. Our goal is to give you peace of mind and help you keep your family and home safe. 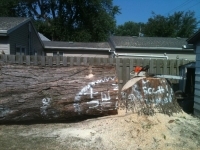 If we believe a tree is stable and will be around for a while, we will let you know. 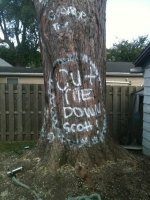 Economy Tree Service is not going to play on your fears to convince you to remove a healthy tree in order to make revenue. Hazardous trees are everywhere, if you have a tree that does any of the following, call now! Has split right down the middle. 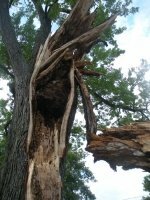 You can’t ever truly predict what a tree will do; a tree that looks like it’s going to fall in front of you may stay for years, just as a tree that looks perfectly healthy could have a mechanical flaw that the untrained eye cannot see. 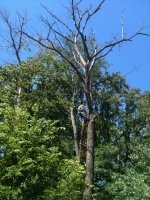 Call Economy Tree Service for a professional opinion of the health of your tree. You should water your trees at night and early in the morning to allow for proper transpiration (sweating).